Roll up garage doors are made out of steel. You get the doors in chromadek or galvanised. Roll Up garage doors have the advantage of saving you space and at the same time providing you with security. The door is designed in such a way that, on opening, the strips of metal that make up the door roll onto a metal drum placed above the doorway on the interior wall. 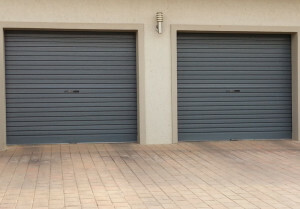 Roll Up garage doors can be manual or automatic, the latter being the more popular, simply because you do not have to leave the car to open the door yourself, which would be an inconvenience in inclement weather and might put you at risk from possible hijacks. These doors usually feature an automatic lock that locks itself when the door reaches its fully closed position. Metal Roll Up garage doors are available either as a galvanized colour or in a number of Cromadek colours, which can be chosen to suit the decor of the exterior of your house.